What do those colorful iPod Nano cases have in common with sapphires? In both substances the color is not on the surface, but integrated in the structure of the material. As usually, [Bill Hammack] unveils the interesting concepts behind coloring metal through anodization in his latest Engineer Guy episode. We’re not strangers to the anodization process. In fact we’ve seen it used at home to change the color of titanium camping utensils. 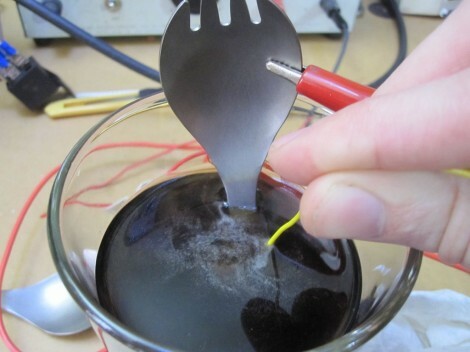 [Bill] explains what is actually going on with the electrochemical process; touching on facts we already knew; like that the voltage range will affect the color of the annodized surface. 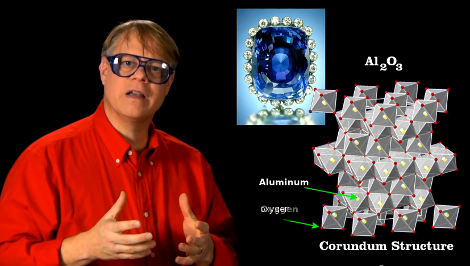 But he goes on to explain why these surfaces are different colors and then outlines how anodized metals can be dyed. That’s right, those iPod cases are colored with dye that will not wash or scratch off. Pores are opened when the aluminum goes through anodization. Those pores are filled with dye, then the metal is boiled in water which closes them, sealing in the color. Pretty neat! We don’t really have any titanium lying around, it’s not exactly a cheap material. But this hack that shows you how to anodize titanium in your home laboratory (or kitchen for that matter) and it might help the metal make its way into a future project. It seems the process is not overly difficult or dangerous and it’s possible to achieve a lot of different colors in the finish. In the image above [PinkFlute] is using Coke Zero, a sugar-free soda, as the chemical agent in the process. The alligator clip attached to the utensil is providing the positive voltage and the yellow wire dipped in the drink is negative. Finish color is determined by the voltage supplied. You can choose various shades of green, purple, yellow, and blue based on a voltage range of about 100V to 20V. This is one of two anodizing methods shown. the other uses a foam brush dipped in soda with the negative lead clamped onto it. You just brush in the electrified substance to alter the camping spork’s finish.